It was 1996 when John Kotter first published Leading Change and told us that 70% of all major change efforts by businesses fail. Nearly two decades later there is little evidence that any improvement has occurred, and this 70% failure rate has become axiomatic in business development and change management circles. Despite some individual successes, change remains difficult—and few companies manage change successfully. According to Kotter, there is a common factor behind the vast majority of failures: businesses do not have the holistic approach to managing change that is needed to see the change through to success. One 2010 study shows that 29% of change initiatives are launched without any formal structure at all. “… [I]n a rush to change their organizations, managers end up immersing themselves in an alphabet soup of initiatives. They lose focus and become mesmerized by all the advice available in print and online about why companies should change, what they should try to accomplish, and how they should do it. This proliferation of recommendations often leads to muddle when change is attempted” (Cracking the Code of Change). Consultants unfortunately can add to the problem. Too often we encourage you to rush headlong into action by trying to sell our solutions—tools for team building, communication skills training or leadership development programs—rather than selling you our expertise for working with you to identify your company’s particular need for change. 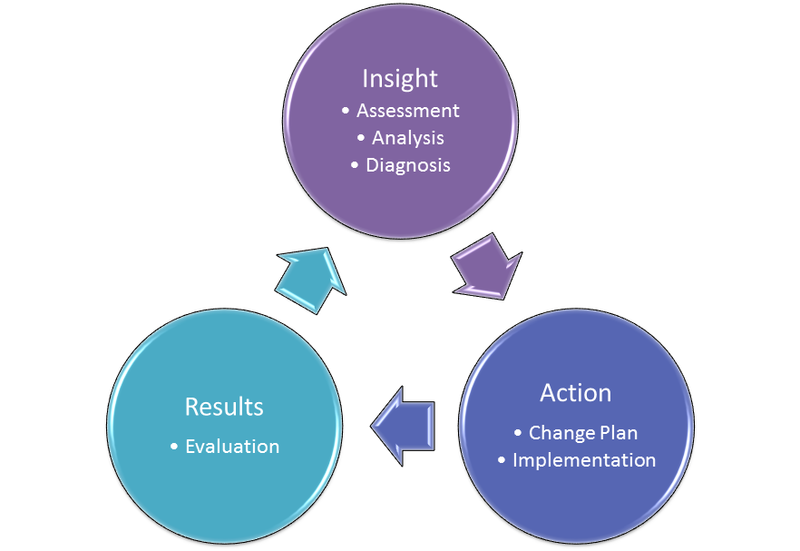 In an earlier blog, I described the Organization Development process of INSIGHT-ACTION-RESULTS. It is easy to skip over insight (the stage of assessment, analysis and diagnosis) to action by proposing solutions without having worked with you to gather information about your organization and without having identified the specific strengths and weaknesses of your organization. In the hope of standing out among all those who are clamoring for your attention, consultants may run the risk of not helping you develop your business case for the change. Change should only be pursued in the context of a clear goal. Making changes without knowing why your company needs that change or how it will benefit from that change—that is, without having a clear business case for change that everyone understands—is a waste of your time and resources. Moreover, changing just to be part of the latest fad is counterproductive; doing so lowers morale and increases cynicism. Change for change’s sake is a recipe for failure. Everyone involved must understand the business case for whatever change you are considering. Otherwise, your people will only focus on what they have to lose rather than on what they have to gain. They might comply with the change initially, but they will soon revert to the old way of doing things. Organization change is a strategic imperative in today’s fast-paced business environment. Unfortunately in the pursuit of change and trying to be the best, managers frequently chase after the latest and greatest idea. In their haste, they forget the fundamental and sound principles that are prerequisites for successful change to occur. Assessment and Analysis: Successful change is always data driven and requires that we take the time to gather information and analyze data. Diagnosis: Successful change is built on your organization’s strengths and addresses your organization’s needs and weaknesses—not some other company’s strengths and weaknesses. Business Case: Successful change requires that you have a clear strategic vision for the change that provides purpose and direction to the change. Although managing change is difficult, implementing these few tried and true principles can help you improve your organization’s success. « Why Organization Development? It’s all About Organizational Health.